At Silverline Private School we have a clear expectation that students’ behaviour as well as their attitude to learning will be excellent. We have in place both positive reinforcement practices and clearly established procedures for dealing with incidents of unacceptable behaviour. Any measures and sanctions applied will take into account individual needs of students. 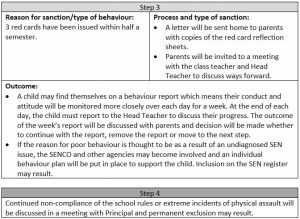 When pupils choose not to adhere to expectations or make poor choices about their behaviour and conduct, sanctions will be applied. Sanctions will be relevant to the misdemeanour and will be clearly explained to the pupil so they understand there is a consequence to their actions. Incidents will be investigated fairly before sanctions are applied. At Silverline Private School it is very rare that we have to apply sanctions as behaviour is consistently good. We also acknowledge that pupils make mistakes and make poor choices from time to time and that they need to be reminded or have additional support to understand the rules in a sensitive and understanding way. 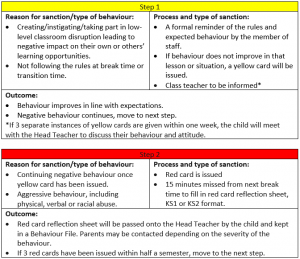 Behaviour sanctions are therefore only used when pupils knowingly break school rules and follow the steps outlined below. Pupils who consistently behave well and comply with expectations will be rewarded. For every house point earned, children will put their name into a box in class in preparation for a class draw at the end of the week. The person who is picked out of the box will receive a small prize. ‘A note from the teacher’ to acknowledge and appreciate instances when pupils have gone above and beyond expectations in their conduct, attitude or work. A celebration assembly will take place every fortnight, led by Head Teacher. Pupils are invited to bring in trophies or certificates awarded from extra-curricular activities. Two children from each class will be entered into the ‘Gold Book’ for an achievement and also receive a certificate. House point totals will also be shared. The winning house from each fortnightly period will be given extra playtime at some point in the following week. At the end of assembly, pupils will return to class for Golden Time. Games, toys and electronic tablets (no phones) may be brought in for this session. The school does not accept responsibility for electronic equipment brought into school and video or camera features must not be used on the devices.